Oh, the depth of the riches and wisdom and knowledge of God! How unsearchable are his judgments and how inscrutable his ways! “For who has known the mind of the Lord, or who has been his counselor?” “Or who has given a gift to him that he might be repaid?” For from him and through him and to him are all things. To him be glory forever. Amen. - Romans 11:33–36 (ESV) Did you grow up singing the Doxology in church? If you didn't (and want to figure out what I'm talking about) or if you want to hear a beautiful version check out this video. Doxology is simply a formula for praising God and often times doxologies are appended on the end of songs or passages. They are a reflection of truth that has been revealed about God. As we close out Romans 11, Paul busts out in song. Some people think this is an early Christian hymn. He is looking back on Romans 1-11 and is so saturated and overwhelmed with God's work in salvation, he can't help but sing. This week we take a look at his doxology. Will you take some time to read through Romans 9-11 again. Do it slowly and think about what God has done and will do. Maybe even flip through Roman 1-11, then come ready to worship together at 10:30 this Sunday. Lest you be wise in your own sight, I do not want you to be unaware of this mystery, brothers: a partial hardening has come upon Israel, until the fullness of the Gentiles has come in. And in this way all Israel will be saved, as it is written, “The Deliverer will come from Zion, he will banish ungodliness from Jacob” - Romans 11:25–26 (ESV) Do you love a good mystery? Maybe when you think about mysteries your favorite detective character comes to mind. Maybe when you think of mystery you think of some event or place that has secrets like the pyramids. When we think of mystery in the Biblical text, it's not about a secret or 'who done it', but about a truth or idea that was once hidden but now has been revealed. God doesn't tell us everything all at once. He progressively reveals truth including Christ. 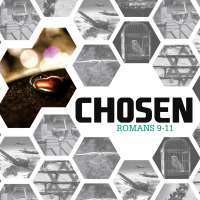 As we close out Romans 9-11, Paul talks about a mystery that involves the fate and future of ethnic Israel. He has a heart to see his brothers come to faith and mystery involves their future and salvation. Take a few minutes to read through the text to prepare your heart and mind to worship together. So I ask, did they stumble in order that they might fall? By no means! Rather, through their trespass salvation has come to the Gentiles, so as to make Israel jealous. Now if their trespass means riches for the world, and if their failure means riches for the Gentiles, how much more will their full inclusion mean! - Romans 11:11–12 (ESV) Have you ever seen one of those pictures that is made up of a bunch of miniature pictures. Each smaller picture makes up a pixel of the larger image. Depending on what medium you are viewing it in, you can zoom in and out. The big picture is made up of all these little pictures. This make me think about the way I often think about God's sovereignty in my life. I'm concerned personally and selfishly for things to go well for me. I want the 'all things' in Roman 8:28 to work out to my advantage, peace, and comfort. I don't think I'm that unusual, but in many ways we are concerned about the little picture. We are concerned about the outcome and effect of God's plan only so much as it intersects with me. When we back up we find out there is a much BIGGER picture that is being painted. It's one we can't always see or comprehend. It's one that at times feels uncomfortable. This week in Romans 11 we are going to pull back the lens. We are going to see how the hardening of Israel intersects with us. God gives us a chance to see the larger picture. In doing so I'm praying we gain a greater love and trust that He knows the beginning from the end even when it's totally beyond our view. Take a few minutes to read back through Romans 11. Slow down and focus on verses 11-24 as you read. Do you see the BIGGER picture? We will also be celebrating God's plan of redemption through communion, so come ready to worship together at 10:30. Will you reach out to someone right now to encourage them to join you? So too at the present time there is a remnant, chosen by grace. But if it is by grace, it is no longer on the basis of works; otherwise grace would no longer be grace. - Romans 11:5–6 (ESV) Do you trust the promises of God? Do you ever fear that you might do something to screw up God's gifts to you? Maybe, He might renege. Maybe I'll cross a line from which there is no return. Maybe God will finally get fed up with my disloyalty and find someone better. Have you had any of these thoughts? I have. Looking at the people of Israel in the Old Testament we see a group of people exactly like us - disloyal and fickle. While there were times of return and repentance it seems like the overall trend was downward away from God. As we get to New Testament times and even until?today it seems like God has left them behind. In our text for the coming weeks, Romans 11, Paul clarifies the present and future of the nation. He does this not to just fill us in but to provide confidence in the promises and character of our God. Will you take some time to read through Romans 11 before Sunday? How then will they call on him in whom they have not believed? And how are they to believe in him of whom they have never heard? And how are they to hear without someone preaching? And how are they to preach unless they are sent? As it is written, “How beautiful are the feet of those who preach the good news!” -- Romans 10:14–15 (ESV) Maybe your feet look better then mine, but I would not point to them as my most attractive feature. Paul says that feet can be beautiful, not because they are neatly groomed, polished, or accented. He calls them beautiful because of their ability to carry an important message to those who haven't heard. This week we continue our exploration of Romans 10. In this section Paul tells us what part we play in God's unfolding plan of redemption. It's one that we are often hesitant to carry out. With the knowledge of the gospel and hope of God's saving work, Paul calls us to go and to speak. For I bear them witness that they have a zeal for God, but not according to knowledge. For, being ignorant of the righteousness of God, and seeking to establish their own, they did not submit to God's righteousness. For Christ is the end of the law for righteousness to everyone who believes. - Romans 10:2–4 (ESV) When you think of an 'on fire' Christian what does he/she look like? Often those that are new to Christianity are not just as 'saved' but 'SAVED, SAVED!' They are busy with the disciplines, telling people about Christ, and rooting out sin in every corner of their life. We look at them and wish we could re-ignite that passion, but is that the best? Is that what Christianity is like? In Romans 10, Paul returns to his desire to see the Jewish people come to Christ, but in their passion they missed something fundamental. Take some time to read through Romans 10. See if you can identify what that might be, and why it is important. I am speaking the truth in Christ—I am not lying; my conscience bears me witness in the Holy Spirit—that I have great sorrow and unceasing anguish in my heart. For I could wish that I myself were accursed and cut off from Christ for the sake of my brothers, my kinsmen according to the flesh.- Romans 9:1–3 (ESV) When it comes to Romans 9-11 many people want to skip over it. It deals with a few subjects that can be not only difficult to understand but controversial. The outline and explanations of God's work in salvation in Romans 1-8 lay out this grand landscape of what God has done. Romans 12-15 give us direct and practical applications to live out this new life of faith, but in the middle people see some theological doldrums, Romans 9-11. These chapters contain some important pieces that connect us to the character of God, situate us in the Biblical storyline, provide us assurance, and motivate us to live out the mercies of God. As we head into these chapters I want to encourage you to read through them and become familiar with them. We will examine the sovereign call of God by first looking at the place and plight of the nation of Israel. Did God change His mind about them? Or did his plan fail?